A report by the European Banking Authority (EBA) has revealed that banks are increasingly exploring partnerships with FinTechs to support the implementation of digital transformation strategies. The more agile FinTechs, many of which specialise in optimising back-end operations, are helping incumbents to reduce costs while enhancing efficiency and improving the experience for the end user. Across many areas of the banking business model, collaboration between incumbent institutions and FinTech firms appears to be a win-win for banks, who expect these partnership to help increase their revenues and expand their customer base, as well as opening up cost-saving opportunities. However, there are new entrants that would prefer to disrupt banks using innovative technologies, and this has become a concern for banks, especially when it comes to payment and settlement services. The increase in competition in this area, particularly when looking at card payments, low value payments, and cross border payments, is beginning to have a negative impact on incumbents’ revenues. But it’s not all doom and gloom. Despite these concerns, banks are also seeing the benefits in partnering with FinTechs, who can help to decrease operating costs, which could in turn create opportunities to retain and grow their client base by being able to offer lower fees and FX rates. One of the main issues banks have had with digital transformation is not being able to streamline processes due to the limitations of legacy infrastructure, which impacts their ability to introduce agility into current back-office operations. FinTech firms, who have benefited hugely from gaining access to the financial ecosystem via the introduction of the Payment Service Directive and open banking initiatives, have been able to develop solutions that optimise legacy systems, including Application Planning Interfaces (APIs). APIs can be created to perform a single function to deliver a niche, but significantly improved experience to the end user. The nature of APIs means that they work seamlessly in the background, and as they are not in any way involved in the customer relationship, this is allowing banks to move up the value chain and distance themselves from non-core functions. Some APIs have been developed to provide banking-as-a-service (BaaS), which sees the FinTech acting as a financial utility. These APIs can provide banks with greater interconnection across the financial ecosystem, which as a result, is leading to greater disintermediation. 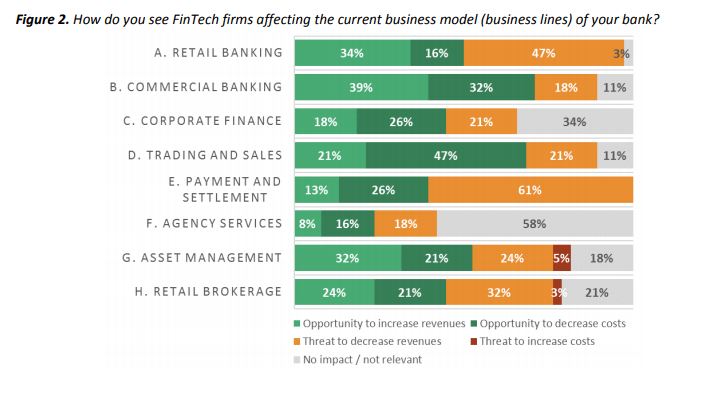 Generally, incumbents are positive about the impact FinTech is having on the industry, and are embracing emerging technologies. Thanks to partnerships with FinTechs, incumbents are no longer having to invest heavily in new technologies, and collaboration seems likely to continue, possibly at an accelerated rate, for a long time to come.